It’s been a while since we’ve had a good recipe on the front page. 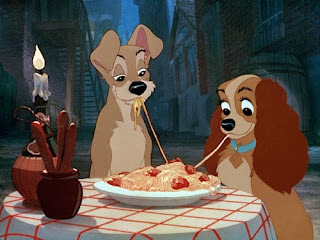 So, for all of the romantics out there, put your heart on your sleeve, an extra meatball on your sweetheart’s plate, and whip up this recipe for the famous sauce and meatballs from Lady and the Tramp. Heat oil in heavy saucepan. Add onion and garlic, sauté about five minutes. Add tomatoes, basil, oregano, and sugar; bring to a boil. Reduce heat; simmer until sauce thickens (approximately one hour). Combine Beef, bread crumbs, egg, garlic, onion, parsley, basil, nutmeg, salt, pepper, Parmesan cheese, and pine nuts; mix thoroughly. Shape into 1 1/4-inch balls. Add meatballs in batches and cook until brown on all sides (approximately 8 minutes). Combine meatballs and sauce and serve over one pound of freshly cooked pasta. And here I am trying to diet. Here at Doc Central we've already begun dietary preparations for the September trip. Typical - the day that I don't get to have dinner until later in the evening, and you post something that has my mouth watering! This, I am going to cook very soon. Short reply. Long appetite. Thank you.